Have you ever visited Portland, Oregon? Portland is a city full of beautiful scenery, with a laid back and fun downtown scene, and its own independent feeling. Sadly, I can claim only one visit to this beautiful city. I can also sadly say that on that trip I almost missed experiencing this beautiful city because of work – and I wasn’t even on a business trip. It’s quite simple to explain, to be honest. I was on a vacation with my entire family, but all it took was one phone call and text from a client to make me teleport mentally back to my office in Idaho Falls and become engulfed in their issue instead of enjoying my vacation with family and friends. Luckily, my husband sternly reminded me we were on vacation and my fully staffed office was capable of assisting my client. I pleaded with him for a few minutes to just “take care of things,” but he refused. So away went my phone and my lifeline to work and workplace stress for five days ... and am I glad he interceded! Looking back, I can say present work self would be pretty ticked off at my previous work self for letting workplace stress rob me of family vacation memories just to appease one client in their moment of need. I won’t lie, however, by saying I didn't check my web mail a few times to make sure everything in the office was fine. My situation is not unique. In fact, work life and personal life intertwine so much nowadays that workplace stress has become a major issue in today’s society. There is not one person I can think of that can say they are exempt from workplace stress – and more than likely the same amount of professionals could probably attest to not being able to effectively deal with workplace stress. In a 2013 survey by the American Psychological Association, 36 percent of respondents said their organizations provide sufficient resources to help the manage stress. This means there are a lot of stressed-out professionals working in the same office as you for a company that doesn’t offer any assistance for managing workplace stress. To play devil’s advocate for businesses, identifying successful stress management programs can be difficult to cater towards everyone’s individual needs, and often times most management professionals may not be able to identify the stress levels of those reporting to them. That means it’s up to us on the individual level to take a stand against workplace stress. But where do we even start? Like any other problem – identifying the issues to resolve is the first step. Identifying your stressors is pretty important in step in reducing workplace stress and no different from any other problem resolution. Keep in mind this step by itself takes some time and soul searching. If A causes B and I get upset/stressed out at point C, maybe the stressors are A or B or both. Stressor identification is crucial to eliminating workplace stress. Next, it’s important to create healthy responses to your stressors. This can be a million things, from delegating workloads, talking to friends, exercising, quality rest and relaxation time. Responses are based on personal preferences and recognition of what works from person to person. I personally have a date with a treadmill and weights once a day (schedule permitting, of course) to keep calm and working on. We weren’t born to work – therefore it’s ludicrous to think we should live to work. Work and careers are an important part of each of our lives. However, it’s even more important to have work-life balance by establishing boundaries for work in your personal life. Life is short and so is our personal time. It’s important to get some rest and relaxation every once in a while. You are not a machine. Our bodies are designed to take a break every once and a while to recharge. It’s important to take whatever time you can to recharge both mentally and physically. Trust me when I say that not sending that last email off at 2:30 a.m. won’t demolish your career (and this comes from a frequent late night emailer). session with your significant other after work – it’s is important to have a support system that helps you through stressful times. You would probably be surprised on how advice from a support system can help bring things into a new perspective or even help to see options you may have not considered. So take it easy, why don’t you, and enjoy the rest of the summer stress free! Your boss and your friends will thank you! 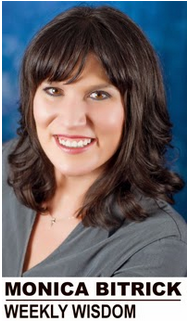 Monica Bitrick is the CEO of Bitrick Consulting Group, a human relations company in Idaho Falls. Thanks for this healthy perspective on stress. We can't always control our stressors, but we can control and choose our responses. Identifying stressors helps lower stress because we become less resistant to the circumstance. In other words, identifying stressors leads to acceptance, which paves the way for relief.